My modeling career has followed the trajectory of what I feel is common to many American modelers. I inherited my brother’s Christmas train set that was an oval on a sheet of 4×8 plywood. The 4×8 doubled, and was eventually replaced by a 10’ x 12’ basement empire, all by the time I was the ripe old age of 20. Then real life showed up and I was off to college to seek my fortune. Family and career followed as my models were put away, only to collected dust for several years. Becoming a home owner allowed me to dig out the old boxes from my parents’ basement a few years ago. 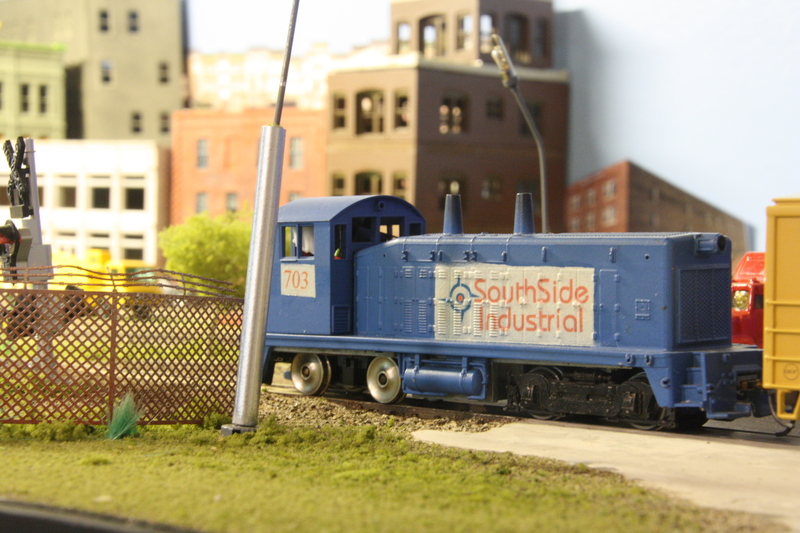 I secured a section of a spare room, dusted the cobwebs off the old rolling stock and set up a small industrial switching layout, which I call the Southside Industrial District (follow my blog at http://www.smallurbanrails.wordpress.com). During the active periods of railroading in my life, I did the typical: grew a rolling stock and locomotive fleet, practiced scenery, learned wiring, and honed my modeling skills. Beyond ground cover and weathering, I paid little attention to presentation of the layout as a whole. Saw horses and visible dimensional lumber were good enough for me. I tacked on a few sheets of paneling to the benchwork and called it a day. Lately, I’ve begun to think of how the layout exists in its environment in total. Lighting, fascia, sight lines, skirting and experiencing the layout in its entirety all contribute to this thing I am calling presentation. The Southside Industrial District was originally housed in a 28” x 88” closet (thus its dimensions, which are the same, even until today). I left the light on in the closet one afternoon and returned later in the evening to a darkened room. 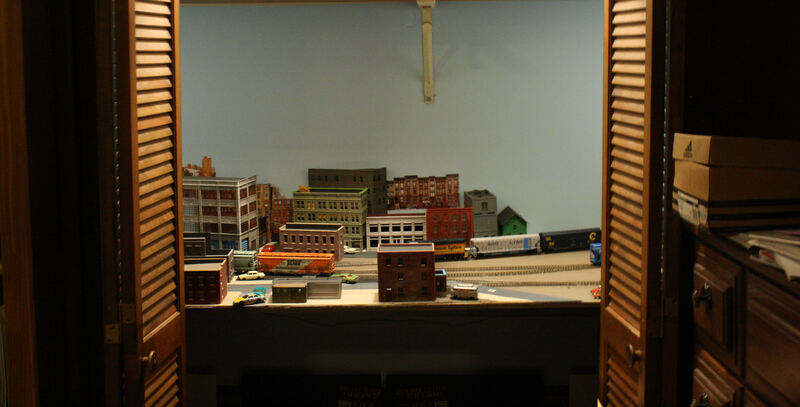 The HO scale skyline of the Southside popped out of the darkness. 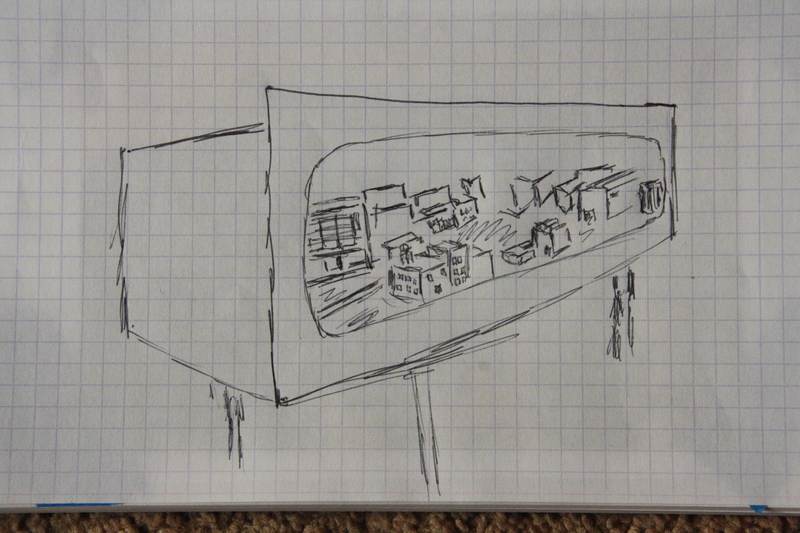 I decided then and there I wanted to eventually maximize the effect for my visitors even if now wasn’t the right time. 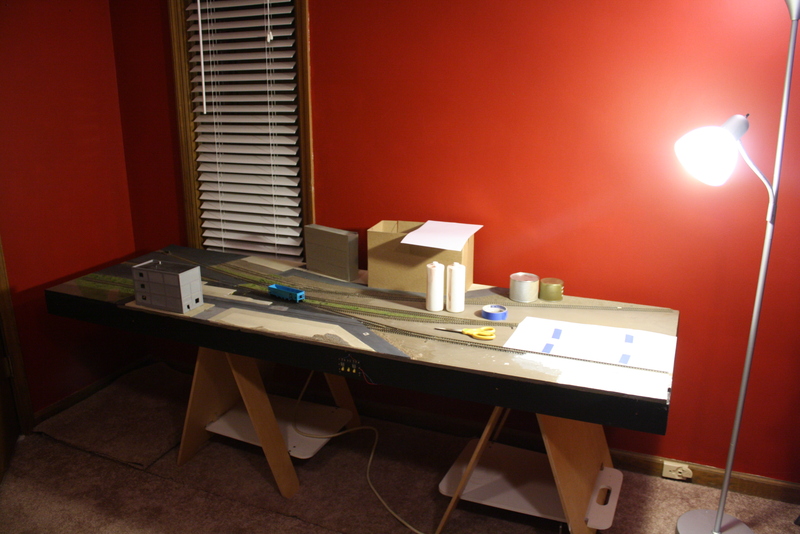 Later, the railroad was moved to function outside the closet as a stand-alone module, moving from room to room until eventually finding a home in our new garage / studio space. 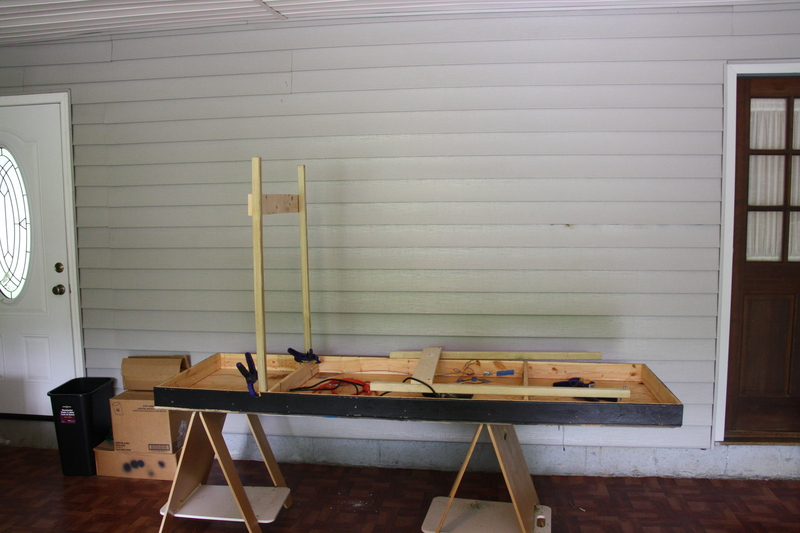 Still resting on saw horses, the time had come to raise the rail height, create dedicated legs, and add a theatre-style shadow box to the front. It was time for the proscenium arch. Until recently, most US modelers have given little attention to presentation. Layouts are built as permanent structures, often bolted to the wall. If you want to see your friend’s layout, you go over to his house and head down to the basement. In UK and Europe, things progress differently, I would guess mainly due to stricter space constraints as compared to the US. First of all, layouts tend to be smaller on average. Other countries simply don’t have the space per person the build pikes the size of their American counterparts. Second, the layouts are built as stand alone entities and not merely as a club NTrak or Free-Mo module to be assembled at a meet. Layouts are crafted to function and stand (literally) by themselves. You can see this in the work of British author Iain Rice, modeler Paul Allen and his Ingleton Sidings layout, and others. A possible third reason as to why Americans build their train layouts with different priorities is that in other countries, I would guess there is a higher participation rate at train shows. Often you’ll find several 1- or 2-man layouts side by side from different scales, eras, locales, and themes. No attempt is made to connect them as the Americans would in order to see who can run the longest train. Smaller layouts standing on their own need to emphasize presentation. 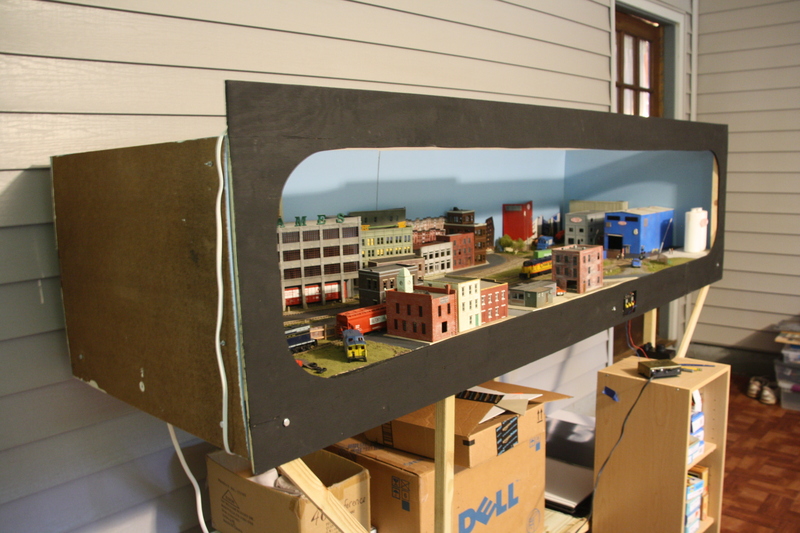 “Picture Frame”, “shadowbox”, “theater-style”, and even “proscenium arch” are all words used to describe ways of framing your layout in a box to maximize and control how users experience your models. There are a couple of different approaches to making your master creation stand out in its surroundings by using one of these styles. The simplest might be what I refer to as the “picture frame” method. This is the method I’ve chosen for my own layout and describe in more detail below. It consists simply of creating a picture-type frame to frame the layout and adding it to the front fascia. 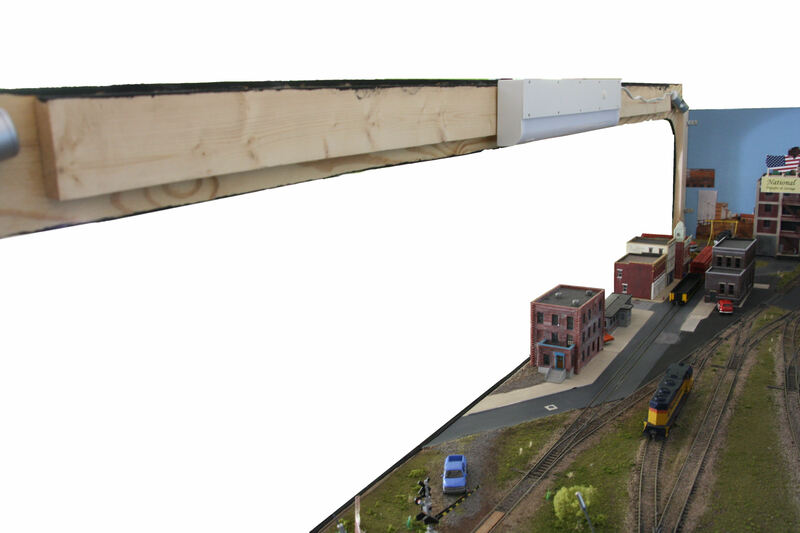 A good example of this is the recent Olympia logging layout from Model Railroader Video Plus, a joint venture with Model Railroader Magazine. Their video website has a good tutorial on how to add a picture frame to a presentation layout. Another way to do it is with an overhang, or valance, in which the top of the front frame hangs over the front of layout by a few inches and usually houses a lighting fixture. 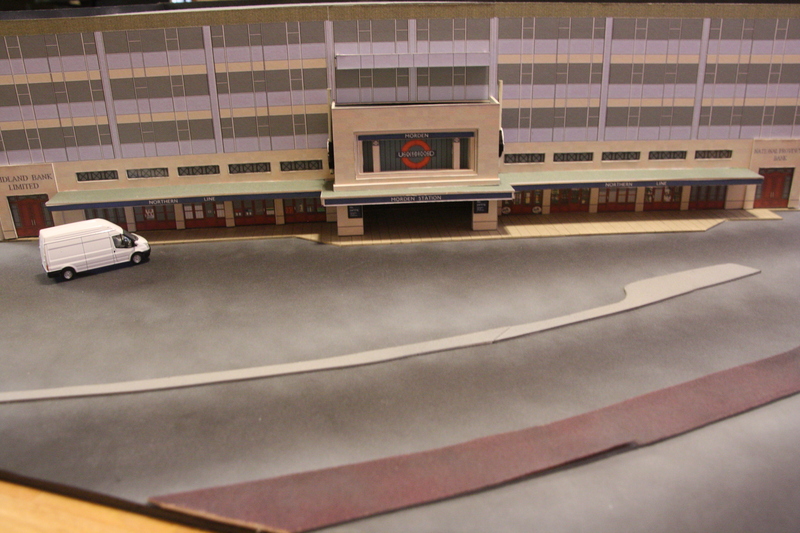 This way, the light can shine down onto the front of the layout. Iain Rice is a big proponent of this method and you can see in almost any of his track plans. Even his book Shelf Layouts for Model Railroads (2009, Kalmbach Publishing) has a diagram on the cover. Larger home and club layouts often have a permanent valence attached to the ceiling which controls lighting and sight lines. There are also museum type displays which can be quite extravagant. 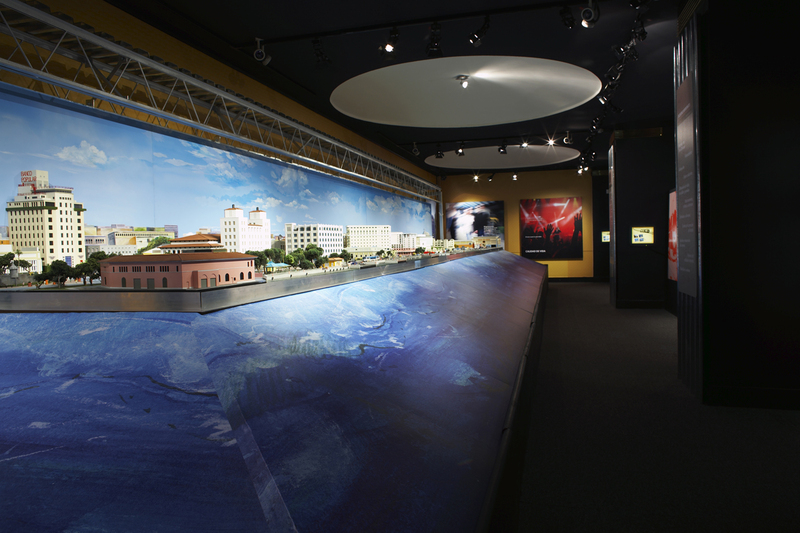 Some may even include a model railroad as a portion of a larger theme, as in Banco Popular’s light rail tram proposal for Puerto Rico by Smartt Inc. and Estudio Interlinea. Do an internet search to get an idea of the variety of styles and see which is right for your circumstances. Of recent note in the hobby press is the aforementioned Olympia layout as well as the High Line featured in Kalmbach’s Great Model Railroads 2015. 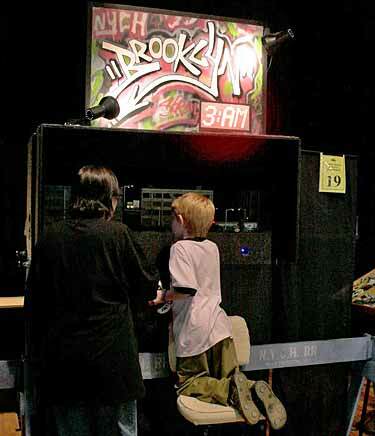 Brooklyn 3am by a man whose internet handle is “Prof Klyzlr”, is another great layout that takes all aspects of presentation into consideration. You can see an excellent discussion of the Prof’s layout at Carl Arendt’s Micro Layouts website. 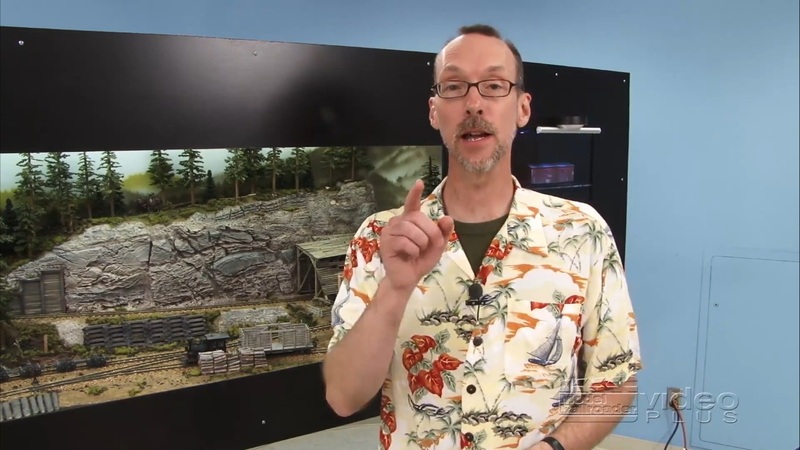 Pay special attention to the treatment of the entire “feel” of the layout including sights, sounds, and animation. 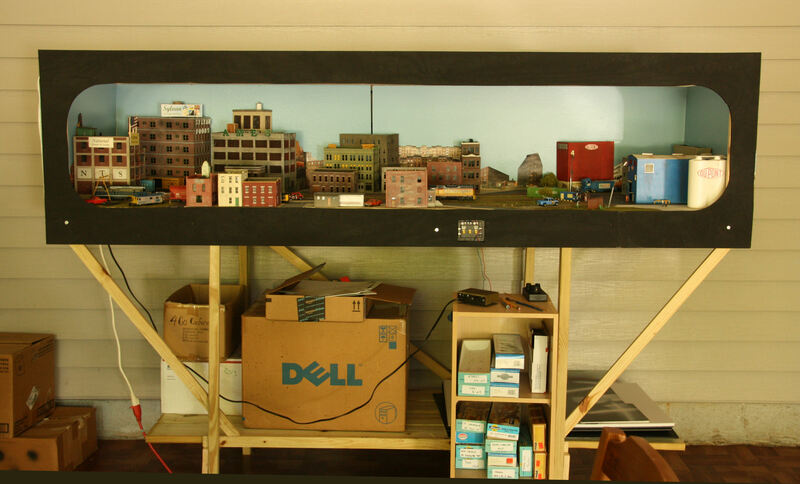 This is one layout that continues to inspire my modeling and motivated me to consider this project of adding a proscenium arch to enhance my visitors’ experience of my model railroad. I chose to build my shadowbox as a flat-on, picture-frame style. 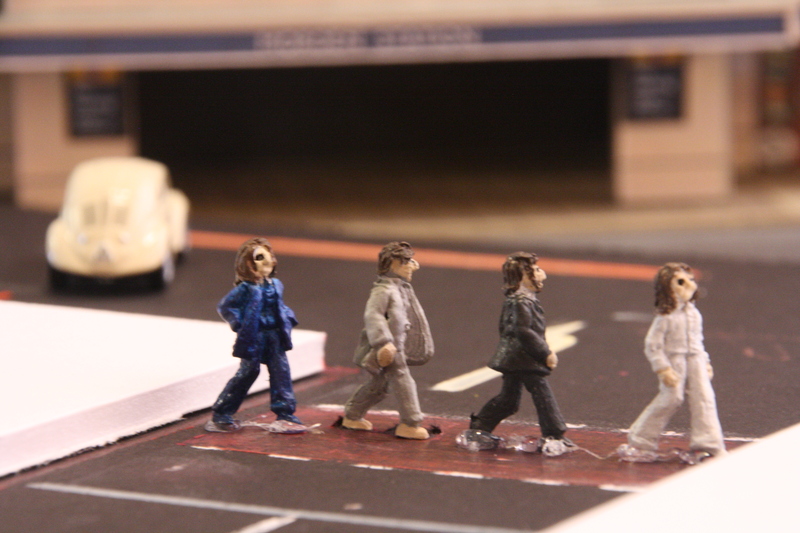 The layout was already built and operational with backdrops on three sides. The backdrop and “sidedrops” were already in place, so I had to work within those constraints. I chose to put a “flat” window on the front, framing the railroad for maximum impact. The layout had been moved about frequently as sat on a pair of saw hourses, so the first step at hand was to raise the layout height and give it its own legs. I followed standard practices of 2×2 legs braced with 1×2 cross members. These were attached to the 1×4 cross pieces of the frame of the layout with ¼” carriage bolts for a semi-permanent installation. A 1×4 brace at the bottom of each leg structure provided additional support as well as a support planking to create some storage shelving. I chose 3/16” plywood as my fascia material. The window “frame” had to be strong enough to hold its own weight, yet sturdy enough so it wouldn’t sag or buckle. The frame would be attached to the 1×4 members of the layout frame. There would be no cross bracing from the frame to the backdrop for added support. I first measured my stock plywood to match the width of the front of the layout and the height of the already existing side drops. After cutting to size, I clamped the stock in place to the front of the layout. Then I drilled ¼” holes for carriage bolts. 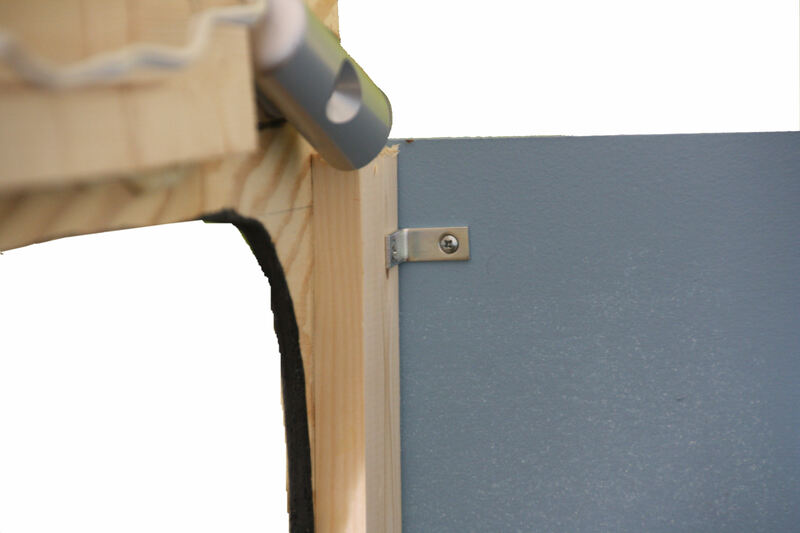 The bolts are used to secure the frame as well as index for position. As with the leg assemblies, I used carriage bolts so the frame can be removed for layout transport or maintenance. Next I cut the opening using a jigsaw. While the plywood was attached to the railroad, I marked the height of the sub roadbed against the plywood from the inside. I also marked space at the top for my lighting fixture with some added clearance. I used that same measurement (4 inches) to mark the width of the sides of my arch. Now a box “window” was marked on the plywood stock. I found a plastic lid from the kitchen to round the edges to give a softer feel to the viewing window. It was about 24” inches diameter or maybe a little more. It doesn’t really matter as long as you’re happy with the results. Find something that works for you. With the window marked out, I used a saber saw to make a doughnut hole in the board. The cut was mostly free hand, although you may wish to use a straight edge on the longer sections. I painted the front side with a flat black latex-based house paint. You’ll want to pain the underside (inside) as well. Finally, using the previously drilled holes as guides, I attached the window frame to the layout using the carriage bolts. The arch frame was light enough so it doesn’t put undue stress on the layout structure, but as expected, it was a bit wobbly and lacked the internal structural strength to keep itself straight. I needed to brace the structure as well as attach it to the existing backdrop pieces. I placed 1×3 pine pieces cut to length along the top and two sides. Standard wood glue secured the pieces to the arch. 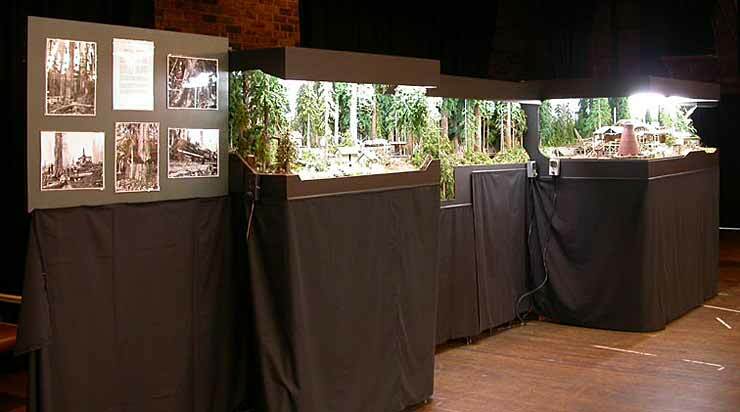 Fitting was done in place to insure clearance with existing scenery, side drops, structures, etc. Detail showing the back of the shadowbox fascia attached with angle brace to the Masonite sideboard. I picked up some common metal corner braces at the local hardware store of about ½ inch long on each side. These were attached with the provided screws to the inside on the braces and side drops. These braces were a small detail, but probably did the most for keeping the sides stable and true. The lighting is provided by an off the shelf 18 inch fluorescent lighting fixture. I considered LED strips, but I wanted to keep the cost down for my first attempt. I actually tried various LED under – cabinet lighting fixtures, but they really weren’t bright enough. The fluorescent fixture was a nice compromise of cost vs. brightness. After verifying the supplied power cord would stretch to the edge of the layout, I attached the lighting fixture to the top 1×3 stiffener with the lamp screws that came in the package. The fluorescent light left some dark spots on the edges of the layout, so I used some battery powered LED lights on the top edges of the frame. These come with a sticky attaching fixture, and can be angled as desired. 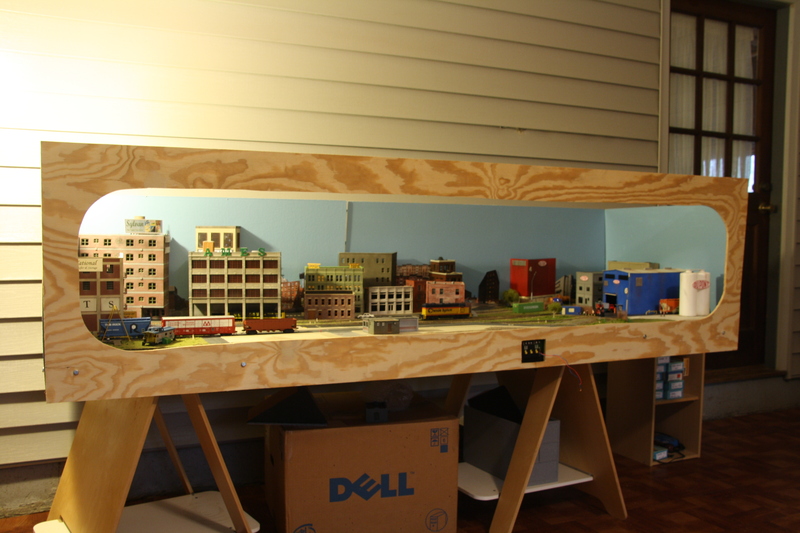 Finally, I attached a power strip to the under side of the layout. The light fixture as well as my DC power supply plug into the power strip. The power strip is plugged into the closest outlet. The Southside Industrial District with its theatre style proscenium arch complete. The final step will be to add some black skirting to hide the underneath storage and complete the effect. The improvements to the layout have been fantastic. The proscenium arch and lighting really set off the layout within the room. Visitors are immediately drawn to the presentation of the trains. Plan on incorporating presentation in designing your next layout or add it to your current one. The results are worth it and you’ll be glad you did.